Softcover, 688 pages, 352 photos & illustrations, plus appendices, notes, bibliography and index. Scheduled for publication in 2002. America’s first offensive after Pearl Harbor! Eight months to the day after Pearl Harbor, the Marines landed on Guadalcanal opening the first U.S. offensive of World War II. The U.S. halted the Japanese advance at Midway and the Coral Sea...but in the Solomons, we not only stopped them, we began pushing them back! 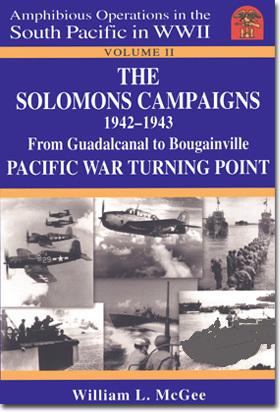 All Solomons Campaigns—from Guadalcanal to Bougainville—are described in this book. The author also continues to follow the new landing craft crews featured in The Amphibians Are Coming!, Volume I, in this series as they move up the Slot with each new campaign. Part I, The Southern Solomons covers the bloody six-month struggle for Guadalcanal. The relationship between ground fighting, naval warfare and air combat is described in considerable detail as first one side and then the other gains the advantage. Seven major naval engagements are recounted including America’s severe defeat at Savo Island and decisive victory in the three-day Naval Battle of Guadalcanal—another notable turning point. Acclaimed Guadalcanal historian, Richard B. Frank, wrote, "No campaign in World War II saw such sustained violence in all three dimensions—sea, land and air—where the issue hung in doubt so long." Part II, The Central Solomons chronicles the amphibious operations in the New Georgia Islands group including the five separate landings at Rendova, Segi Point, Viru Harbor, Wickham Anchorage, and Rice Anchorage, plus three more significant naval battles and the occupation of Vella Lavella. Part III, The Northern Solomons recounts the seizure of the Treasuries, the Choiseul Diversion and the Bougainville campaign, plus two more significant naval battles. Lessons Learned—Finally, the many valuable lessons learned during the Solomons Campaigns are summarized—ranging from logistic support and force requirements to offshore toeholds and leapfrogging. Most became doctrine in later Pacific campaigns. Volume I, The Amphibians Are Coming! Emergence of the `Gator Navy and its Revolutionary Landing Craft. Published 2000, Reprinted 2001. Volume III, Pacific Express—America’s World War II Military Supply System. Scheduled for publication in 2003. William McGee joined the U.S. Navy in 1942. He writes from the unique perspective of a volunteer enlisted man, one who has been there and done that. On his first deployment to the South Pacific, he was greeted by a major air attack, followed by the torpedoings of two navy cargo ships in his Task Unit—both actions occurring within two weeks of his arrival in the Solomon Islands. He is the author of ten other books. "Just finished reading your Volume II, The Solomons Campaigns, 1942-1943. This book has to be the most comprehensive, as well as interesting, book that I’ve ever read on the war in the Solomons. You are to be congratulated on compiling this vast amount of information—and from both sides, the Allies side as well as the Japanese’s version. I wholeheartedly recommend this book to anyone who has an interest in what really went on in the South Pacific. As a Marine veteran who landed on Guadalcanal, August 7, 1942, reading your book brought back many memories of those very dark days we shared. Semper Fi." "Bill McGee, a prolific author and veteran of naval service in the South Pacific, has written a book that will do any ‘Amphibian’ proud. He has managed by dint of exceptional research and extensive interviews to perfectly blend the historical development of naval amphibious forces with humorous anecdotal references. "If your children or grandchildren have ever asked, ‘What did you do in the war?’ then point them to this book. Throughout the book you will find yourself saying, ‘Yup, that was us,’ and I guarantee you’ll have a renewed respect for the guy you see in the mirror every morning." "Congratulations! I’m impressed with the scope of your Solomons Campaigns. The struggle for control of the Solomons was certainly a critical turning point in the Pacific war. You have managed to blend the amphibious operations with anecdotal incidents, while achieving a difficult objective: compressing all Solomons operations into one sweeping and compelling narrative. Many a Marine will enjoy this read." "No matter why you turn to the pages—for reference, enlightenment or nostalgia—you will immediately rediscover your own life and the lives of ordinary guys who helped save the world from becoming the domain of mad men. A ‘must’ addition to our libraries." "Just finished The Amphibians Are Coming! A fascinating and accurate history on the landing ships and craft of WWII and a welcome addition to the short list of books on the subject. It brought back many memories, even tears to my eyes. I look forward to your next two volumes on the Pacific War. For me, it’s a long-awaited dream since they deal with my kind of war. You’ve brought great pride and joy to thousands who were there and to future generations who will learn how America fought in the Forties." "My own feeling, in reading Bill McGee’s book, is that it describes miracles. I’m serious. First, the miracle of bringing LSTs and other landing vessels into high production only a short time after the original designs were created. Then the miracle of bringing together untrained officers and men to perform tasks which should have required months of training and experience. Finally, there was the miracle of making all this work under unbelievable combat conditions. One wonders if the same achievements could be possible today." "Having personally experienced a full measure of life at sea during World War II, in both Atlantic and Pacific Oceans, I found The Amphibians Are Coming! a ‘must read’ and not just for veterans. It is detailed, vivid and accurate." "Bill McGee, himself a veteran of the World War II navy, has not only done some exhaustive research into the documentation of how the amphibious forces were built, but has added the words of the men who took the theory of the amphibious doctrine and the new machines to sea. His dedicated work will surely help keep the day-to-day naval record of the ‘Greatest Generation’ from being lost." "Bill, you have done a masterful job in dealing with the wide range of Amphibians in your Volume I. I enjoyed every minute re-living those South Pacific days. I particularly liked hearing the stories of the other classes of amphibs, in addition to our own LCIs. You included just the right amount of detail to make the book very readable." "The Amphibians Are Coming! is a great read. I am very impressed with the overall scope of your projected effort. Sandra Maguire’s comment in the press release, ‘Bill McGee…became a serious naval historian buff…’ is clearly an understatement. As they say in the Navy, ‘Well Done!" "…could well become the definitive work on the campaigns." Our friend, Bill McGee, who did such a fine job of telling the story of the early days of Flotilla Five in The Amphibians Are Coming!, has produced another impressive, interesting and highly readable account. This time, broadening his scope to include all services, he has produced a meticulously researched history that anyone interested in this early and decisive campaign will treasure. It could well become the definitive work on the campaigns. With this broader perspective, LCI veterans will see more clearly their particular roles. It gives one a sense of, "Ah, now I see how what we did fit into the whole picture!" The LCI veteran will need to exercise some patience when first opening the book looking specifically for what it has to say about LCIs. The prelude to the war, strategic decisions relating to Guadalcanal/Bougainville, and the story of the six-month struggle for Guadalcanal all are dealt with before specifics of amphibious operations involving LCIs, as well as LCTs and LSTs, are introduced. The shore-to-shore Landing Craft story begins to unfold in McGee’s fifth chapter with the account of the formation of a most formidable sounding organization: ComLanCraFlotSoPac (Commander, Landing Craft Flotillas, South Pacific) and its commander, Rear Admiral George H. Fort. This organization became necessary with the arrival, in significant numbers, of the first LCIs, LCTs and LSTs in the South Pacific. From that point forward in McGee’s book, prominence is given to the roles of each of these types. If you have read McGee’s Volume I, The Amphibians Are Coming!, you know that it centers on the activities of Flotilla Five and, as far as LCIs are concerned, on the war diary of LCI-334, as provided by LT(jg) Al Ormston, skipper of the 334. In this volume, McGee continues this literary device of illustrating the general by the particular and it works well for it would have been a formidable task, indeed, to trace the involvement of all the LCIs. He is not, however, slavishly limited to the 334 alone. Time and again accounts of incidents involving other LCIs are woven into the story. All 26 LCIs in LCI Flotilla Five, commanded by Commander Chester L. Walton, are included in the narrative and several are pictured as well. I was particularly interested to learn the name of the man responsible for the idea of converting LCIs into gunboats. McGee tells us that it was Captain Roy T. "Slim" Cowdrey, a ship repair officer on the staff of Admiral Halsey, who came up with the idea and directed, first, the changes of LCIs 22 and 23 and eventually by December of 1943, the 21, 24, 67, 68, 69 and 70 into gunboats. It is such details, as well as the entertaining and enlightening anecdotes that McGee includes, that make this book such a good read. Get yourself a copy; get into your favorite chair; tell the family not to bother you; and settle down for a great evening of reading and remembering. You’ll be glad you did. Also check out Mr. McGee's other book Bluejacket Odyssey. A added bonus for us is if you order the book using our order form that is linked below before December 31,2001 we will receive 20% from each sale to help support our web site. Click here and print out our order form.